We're having noodles for dinner tonight. You have to come up with a solution; use your noodle! Look at that guy; what a noodle! The concert hadn't started yet, but the musicians were already noodling on stage. Sometimes you have to noodle for a while before you get something right. The writers noodled for a week to come up with a good storyline. Mark likes noodling with numbers. You can also use the word “noddle” as a slang term for the head. This is more common than noodle in UK English. Noodles are usually made from softer flour than Italian pasta. This means that noodles tend to be softer than pasta, which has a firmer, more elastic texture. In English we don’t use the words noodles and pasta interchangeably. We always call the Asian type noodles. Usually we call the Italian type pasta, but sometimes we can say noodles too in this context. In terms of linguistic differences, noodles are countable, whereas pasta is not (this is also true of types of pasta, such as spaghetti or tagliatelle). Noodle, in its most common sense, dates back to the late 18th century, and comes from the German word Nudel, which can be used for any kind of thin strip of dough (including pasta). Its origin is uncertain. The related words, the West Flemish noedel and the French nouille also came from the German. 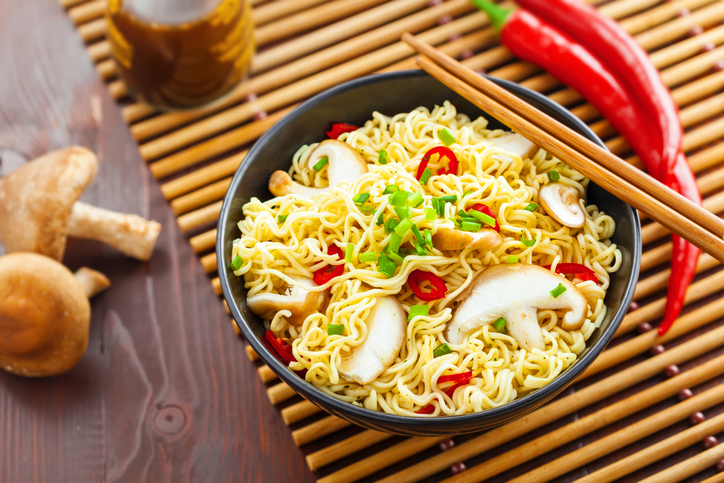 Noodle, used now as slang for head, dates back to the mid-18th century, and originally meant fool. It was probably a variant of noddle, using the oo from fool, but its origin is also unknown. Finally, the noun meaning ‘improvised music’ dates back to the 1920s, and its accompanying verb dates back to the 1930s. Most linguists believe that it came about as an analogy from the flexible and curly strips of dough.